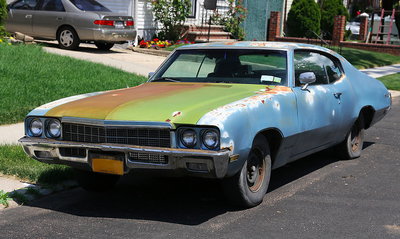 Have a Junk car in Orland Park, IL or surroundings and need money? Give us a call now! We buy your junk car today! We pay cash for your car. No car title? No Keys? not a problem. We've got you covered! We'll have you sign a form to transfer ownership of your junk car... and that's it! Stop staring at this junk car and get money for it today! Press this call button and tell us where your junk car is located. We'll organize pick up of your junk car as soon as possible. Call us now and get cash in your pocket today. Cash for junk removal - Autosalvage. We've all been there... You own something that seems worthless! What do you do? Usually nothing. Well, you know that you need someone to remove junk from your yard when this happens. The only problem is you don't want to spend your hard earned cash on getting junk removed from your place. Am I right? I am gonna let you in on a secret: everything has value! The value of junk, especially junk cars... is all relative to who you are and what you do for a living. You junk car may not be of any use to you, but it still is a lot or material and it has recycling value. For this exact reason, you can always find people - like Orland Park Junk - to pay for your junk car removal. One of the service we provide as a towing company is to pay you cash for junk cars and we even pick it up wherever it is. Not only that but we also take almost any type of junk car. You do NOT need to have the car keys or the car title. We've been in the business of paying cash for junk cars for years and we know all about it. We have the paperwork necessary for you to allow us to tow your junk car from your backyard to a junkyard in Orland Park, IL or any surrounding suburbs you may be living in. You junk car does not have to a be a problem. In fact it can even be a solution for you to put your hands on cash today and pay those bills you just got. All of that being said, keep in mind that we are offering a junk car removal service and we even pay for it ourselves so... as you can expect we are not able to pay thousands of dollars in cash for your car. We'll most likely only be able to pay a few hundreds dollars at most... but hey you'll get to get rid of that junk car with no effort on your end. Give a call today and get that junk car out of your sight! If you live in Illinois within reasonable distance from this area, please feel free to give us a call to get a quote for: we'll let you know if we can remove your junk car and how much money we'd be able to pay you.